Title: Pinot Red or Dead? Pinot Red or Dead? by J.C. Eaton is the third book of the cozy The Wine Trail Mysteries series. While there is some character development that carries over from book to book each book in the series has it’s own murder mystery to solve so they can be read as a standalone if choosing to do so. This series began with Norrie Ellington having been asked to return home to upstate New York by her sister to oversee the family business, Two Witches Winery. Norrie’s sister and her brother in law had been given a grant to study a species of insect in Costa Rica for a next year and while Norrie had made her life in New York City she would be able to continue her job as a successful screenwriter anywhere. Who knew however that returning home to the winery would bring Norrie face to face with so many murders in their normally quiet area though. Now after solving a couple of previous cases Norrie immediately begins investigating when things begin happening with the pinot at Two Witches Winery and the surrounding vineyards. 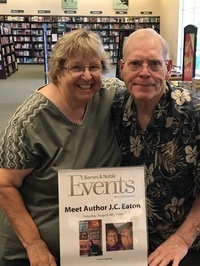 The husband and wife writing team that make up J.C. Eaton have quickly become one of my favorite cozy authors. 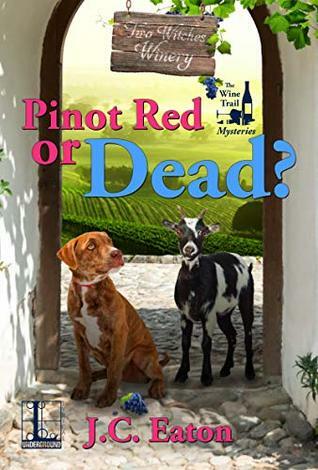 The Wine Trail Mysteries is one of two ongoing series from this duo and one that I get excited with each installment as I know it will be a fun read. These are full of humorous moments with plenty of suspects and twists and turns to the mystery to keep the pages turning quickly. BOOKED 4 MURDER, the first novel in the Sophie Kimball Mystery Series, took first place in the 2018 New Mexico-Arizona Book Awards in the Cozy Mystery Category. I want to start this series, I have read a couple of the Sophie Kimball series and enjoyed them, so expect I would like these as well. Nice review Carrie.